Without knowing the first thing about the nature of chiropractic care, I had always held to the position that I would never go to a chiropractor unless I was in extreme pain and no other treatment succeeded in alleviating it. Well, in the spring of 1998 I reach that point. I found myself practically immobile from a constant, sharp pain in my lower back that shot all the way down my leg and into my foot. I couldn’t sleep and could barely walk. Over the course of a month, three different medical doctors attempted to treat the pain with various anti-inflammatory medications and pain killers. The pain persisted and out of desperation I sought chiropractic care. On my first visit to Dr. Stewart, he explained that chiropractors do not treat pain or any other symptoms of various ailments, but they work to maintain proper alignment of the spine so that the body is in a position to heal itself naturally. Functioning without obstruction, the body will work effectively in healing the actual cause of the problem, not just the symptoms. I was skeptical at first, but after only a few months of chiropractic care I went from barely being able to walk to being able to compete in national martial arts competitions. Over time I also noticed a significant increase to my ability to cope with some stressful personal problems that I had been struggling with for the previous 2 year. 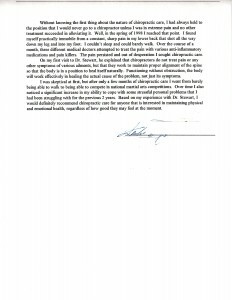 Based on my experience with Dr. Stewart, I would definitely recommend chiropractic care for anyone that is interested in maintaining physical and emotional health, regardless of how good they may feel at the moment.